Useful on any timeframe but really designed for scalping, changes color to show best entry positions in real time. Main components are pip scale, ATR/pivot, MA level, RSI, and spread alert. 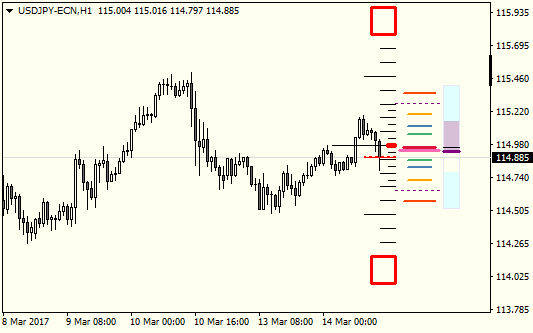 Can be used on any timeframe, but since it’s made for scalping it is somewhat adjusted for M1-M15. Settings: Scale Zero Level Shift. This is simple scale. Middle (zero level) is placed at the middle of the body of chosen candle. This can be adjusted so that you can differentiate reversal from pullbacks. Rule of thumb is: Trend is up when price is above Zero Level, trend is down when price is below. ‌Settings: Mode(Standard,Fibonacci), Period (No of M5 Bars), Lines – Style, Color, Width. and all these are used to calculate pivot levels. Because of that these levels will be dynamic, depending on ATR value, so chosen Period makes big difference here. The lower number the more dynamic levels (they will expand and contract). For intraday trading/scalping Period 12 – 288 is reasonable (1-24 hours). Rule of thumb just like other pivot tools. Settings: Period, Method, Applied price, Timeframe, Line Color/Style/Width. This is additional line that shows latest price of Moving Average from a chosen time-frame. If the level is “outside” the chart the line is drawn at the top/bottom of the chart (longer and thicker). I use EMA(16) of typical price on H1, that shows the trend pretty well. Rule of thumb: trend is up then price is above the MA level, trend is down when price is below. This one may seem confusing at first. (it’s more like looking at RSI from the side, like a plan view). Line shows current RSI, color fill shows plan view of last n bars (min/max value) (n is the same as RSI period). Rule of thumb: RSI > 50 trend is up, RSI < 50 trend is down. Also when trending sideways the color fill is tight around 50. Set the ratio of spread and ATR to trigger alert. When it’s triggered it changes color of Bid/Ask line, and some scale lines to draw your attention. Enable debug mode to show some internal numbers, also spread, ATR and %ratio to help you adjust this level. Ultra – ATR scalping tool is a Metatrader 4 (MT4) indicator and the essence of the forex indicator is to transform the accumulated history data. Ultra – ATR scalping tool provides for an opportunity to detect various peculiarities and patterns in price dynamics which are invisible to the naked eye. How to install Ultra – ATR scalping tool.mq4? How to remove Ultra – ATR scalping tool.mq4 from your Metatrader 4 Chart?